The new Crosswind Specialty Track Sweeper from Elgin Sweeper is making its debut at NASCAR racetracks around the country this racing season. 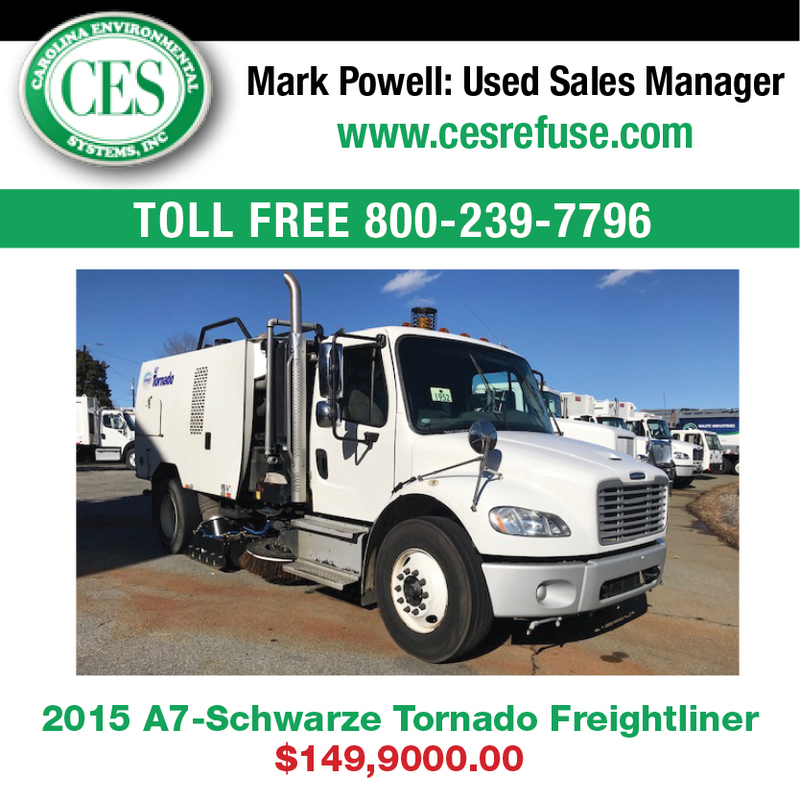 This regenerative air sweeper includes unique features developed for racetrack sweeping and maintenance applications, including a 20,000 CFM-rated blower, a hydraulically-driven, plastic bristle side broom on one side of the sweeper and a high-performance air-blast nozzle on the other side. 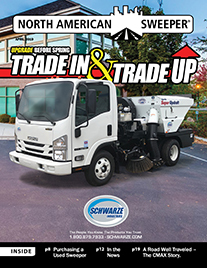 For remote cleaning, the unit also features a soft wall cleaning attachment and a large jib boom-mounted 8-inch rear vacuum hose for the big jobs. Throughout the 2010 NASCAR season – the 62nd season of professional stock car racing in the United States – the Crosswind Specialty Track Sweeper will participate in several events, including races at Daytona International Speedway, Kansas Speedway, New Hampshire Motor Speedway, Gateway International Raceway, O’Reilly Raceway, Iowa Speedway and several other tracks. Sporting a unique racing-themed graphics wrap, the sweeper is easy to spot as it makes its rounds. Giles said the new sweeper was engineered with input from racetrack officials in the NASCAR circuit. 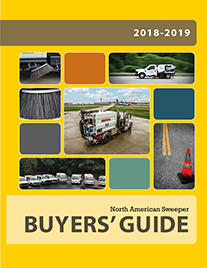 Elgin Sweeper representatives – along with Jeff Miles from Key Equipment & Supply Company, an Elgin Sweeper dealer based in Kansas City, Kans. – participated in, and conducted a training class at, the annual NASCAR Security and Services Summit to address various operations, fire and safety, medical and security issues, including track maintenance. A lifelong racing enthusiast, Miles is also a lead driver for the Richard Petty Driving Experience, which gives him an added appreciation for clean track conditions while traveling to tracks across the United States. He has been helping design and supply Elgin Sweeper units to racetracks, airports, municipalities and contractors for nearly 20 years. In 2001, Miles had the opportunity to sweep the second layer of race surface at the new Kansas Speedway to help prevent airborne dust during a locally televised test session. “My racing experience not only gave me the chance to see first-hand the different tracks and their sweeping programs and challenges, it led to several design ideas for a sweeper that not only excelled on a racetrack surface but also worked efficiently around a racetrack complex,” Miles said. According to Giles, the top transport speed of the Crosswind Specialty Track Sweeper clocks in at approximately 70 mph, ensuring prompt response on and off the track. “It may not be able to keep up with a stock car at top speed, but this sweeper can get from job to job and make quick work of any sweeping challenges that come up before, during and after a race,” he said. The powerful, 20,000 CFM-rated blower is ideally suited for locations where jet dryers can’t be used, such as grass on the inside field, pit areas and weepers (cracks on a racetrack where water seeps through). 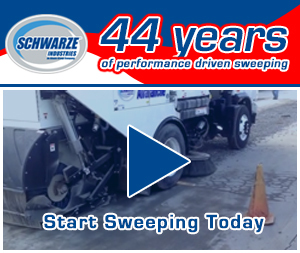 The blower volume, chute height and angle can all be controlled, making the sweeper even more maneuverable and responsive on the job. Using the same 20,000 CFM system, the soft wall cleaning attachment on the sweeper handles water, debris and rubber cleanup. The attachment features a 20-foot lightweight hose for easy operator control, an aluminum vacuum end tube for increased durability and a quick-disconnect for fast and easy installation and storage. For general cleaning, a larger rear door wandering hose is available. Featuring a poly bristle broom construction, the hydraulically-driven high-torque side broom can be controlled pneumatically by the operator inside the cab. The side broom extension allows track cleaning right up to the wall, while keeping ample sweeper distance from the wall for track safety light clearance. Designed for quick and efficient vacuum removal of standing water on racetracks, the Crosswind Specialty Track Sweeper features a rear-door decant system which allows the machine to drain the load without opening the door. A large decant valve and debris filter cage are installed on the door to prevent hose clogging. To verify that the Crosswind Specialty Track Sweeper can operate effectively on the steep banks and inclines associated with various racetracks around the country, the machine was tested for maximum tilt angle at the Caterpillar, Inc., research facility in Peoria, Ill. An in-cab angle measurement system on the sweeper audibly and visually alerts the operator to steep incline conditions that exceed the maximum tilt angle. Professional stock car racing fans can follow along with the Crosswind Specialty Track Sweeper as it continues its tour of super tracks this racing season by visiting Elgin Sweeper’s Facebook page. For more information on the new Crosswind Specialty Track Sweeper, please contact your local Elgin Sweeper dealer, or visit www.elginsweeper.com to find a dealer near you.